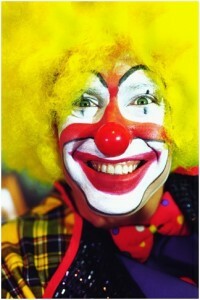 Home » Leadership » Are We Project Managing Or Sending In The Clowns? Or, ways we try to help but actually undermine the project. As a senior manager, try to avoid these. As the project manager, try and manage around them if we can not get relief otherwise. I understand how people flock to what is hot and happening. You know, the big project that the company is doing. I’m just not convinced the “flock” has any idea of the damage they often do in their well meaning to help the project do well. My observation is that since they flock together, and get the same ambiguous results (typically, late and buggy, with lots of noise), they are not able to see — nor often does senior management see — that this flock behavior puts projects at risk. I always considered this somewhat of a “competitive mentality” issue. Some people want to be where the action is and some feel that unless they are actively involved in “the action” they are at risk to becoming irrelevant to the organization. I see this as a problem with the overall culture and guidance in the organization. The fact that managers can “rush” onto projects — suddenly spend the majority of their time on a project they have ignored initially, strikes me as people who don’t really have a good job description or at least a good set of priorities. On a major successful project that ran 18 months, I remember cautioning my team — at about six months out from launch — to be prepared to get more help then we need, and in fact to possibly lose significant control over our project. This indeed did happen. Suddenly, instead of working with managers at our level, the next level of managers showed up, took control and ran the status meetings and directed the day to day tactical actions. They were not as aware of the project as we were. They made decisions such as delaying functionality, for functionality that worked just fine. In one case, they decided to delay the project delivery for a week, for a project that was running on time, because they were uncertain of the quality. No significant problems had been reported and that was unfamiliar territory to them! The account team, wanting to finally give a customer a product on time, delivered it per schedule and ignored the senior manager’s direction. The project delivered on time and had great quality. “Send in the clowns” would seem to be the tactic many companies unintentionally use when wanting to make sure major projects go well. What they miss is that often this extra help takes what can often be a developing pocket of excellence and washes over it the same management mediocrity that is currently holding down the performance of the company. The moral of the story for senior managers is to let our teams do the best job they can and to minimize the extra “help” that too often is no help at all. Senior managers should spend time eliminating barriers and impediments to their teams. Parachuting in to “help” near the end of the project is too often no more effective then sending in the clowns. Have you received “help” that has been more a burden then an assistance to your project? «Project Manager Who Is Really In Charge Of Your Project? Kat Welniak • John, I completely agree. And I think that this is exactly what this article is trying to suggest. Sometimes it is just the perception of, or the need for, the upper management to feel useful when their isn’t anything wrong with the sequence of the project to get it to opening. You can see from my profile that I have a very strong and comandeering presence in the field. What I need is just the support from HQ to make sure GCs get paid on time and procurement is done – not to second guess me or my staff in the field. Afterall, I am paid handsomely to get these jobs done when they are supposed to be done. Yes, the better managers will often ask this question, before charging in to help out. I’ve also tried to suggest to more senior manager where they can help me out — rather than whatever they were currently doing. Sometimes I’ve noticed that were happy to oblige and immediately charged off in a new direction. It doesn’t hurt to try. Kat Welniak • I’ve had these types of projects and it is completely frustrating to the entire team who expected to deliver. In essence, these actions delay the project, create undo costs, and belittles the field commander. It definitely says volumes about the company from the top down. It is a shame. Sally Ziegler • As the project manager one of my most important roles is protecting the company. That means maintaining the complete paper trail, documenting out the rear and being proactive about possible pit falls that I see. If someone else jumps in and something goes awry then I can’t do anything to rectify or mitigate the situation without the correct documentation which typically is now missing. I may have a lot on my plate but ‘helping’ actually makes it worse and ends up loading that plate even more. Thanks for the examples. Too many folks simply don’t understand that this kind of help can really cause problems.